Masik Collegiate Fragrances has added new fragrance duos for seven additional universities: University of Mississippi, University of Kentucky, Texas A&M, University of South Carolina, Clemson University, Virginia Tech and North Carolina State. 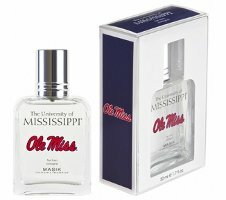 University of Mississippi (Ole Miss) for Men (shown) ~ "Celebrate being a Rebel with the powerful aroma of Univerity [sic] of Mississippi's Men’s fragrance. The aroma of fresh Mandarin and watery marine accords blend with aromatic herb and White Cyclamen to create an inviting top note. An intense back drop of Fir Balsam and Moss provides a long lasting, memorable new fragrance." University of Mississippi (Ole Miss) for Women ~ "Sun-kissed notes of Sparkling Bergamot, Lemon Zest and Ruby Red Raspberry unfold into a sweet body of Black Currant, Blueberry and crushed Tonka. “The Grove” inspires a sensuous and woody dry down with a touch of Vanilla providing a trace of of Ole Miss sweet southern charm." University of Kentucky for Men ~ "Show us your wild side with an exciting new men’s fragrance. Wildcats will enjoy the richness of woods as it is enticed with aromatic notes of Lavender, Cardamom and Tonka Bean. Notes of Green Apple, Bergamot and Blue Geranium open up the fragrance to provide a captivating, masculine aroma." University of Kentucky for Women ~ "Pay tribute to the Big Blue Nation with the alluring new women’s scent. Invigorating top notes of sparkling citrus open up to a heart of Mirabelle plum’s, Vanilla orchids and Wild Jasmine. A comforting back drop of Sandalwood, Warm Amber and creamy Tonka Beans ensures a long lasting, signature scent." Texas A&M for Men ~ "Steeped in tradition this new men’s scent captures the pride and meaning of being an Aggie. Refreshing top notes of Italian Lemon, Bergamot and Iced Pineapple opens in to a body of vivid florals, raw Nutmeg and Cinnamon. Robust base notes of rich Amber, silver Moss and aged woods are deeply rooted embodying the strength of the Century Tree." Texas A&M for Women ~ "Embrace the class and femininity that comes with being an Aggie with this new women’s fragrance. An effervescent top note opens with the support of sparkling White Bergamot and crisp Lemon leaves. Mouth-watering fruits of Plum and Peach entwine with a classic floral bouquet comprised of Violet and Jasmine flowers. Aged wood accords blend with Cedar and sweet Tonka Bean providing a long lasting legacy scent." University of South Carolina for Men ~ "Show your school pride with a new USC men’s fragrance. A powerful and natural back round of crisp cedar, red patchouli, smokey woods and tonka bean is enriched with the aromatic accords of sage, lavender and Juniper berry. A blend of crisp citrus top notes reflects the energetic spirit of USC." University of South Carolina for Women ~ "Support your school spirit with a lavish new women’s USC scent. Sumptuous fruit accords of Red Apple, Blood Orange, Pomegranate and Peach nectar are embraced with exotic tropical florals, rich Plums and Rose petals. This enchanting fruity floral scent is heightened with the sensuality and warmth of Cashmere Woods, Golden Amber and Patchouli." Clemson University for Men ~ "Capture the excitement of orange-clad fans, as they cheer on their favorite teams, with a new Clemson men’s fragrance. The warmth of Sensual Patchouli, Amber and Sheer Musk are invigorated with the natural floral aroma found in a South Carolina breeze. Crisp Bergamot and aromatic Herbacous Lavender enhances the overall appeal of this fragrant combination." Clemson University for Women ~ "A vibrant new fragrance created to pay tribute to the women of Clemson University opens with a fruity, mouth-watering top note. Frozen Melon and sweet nectars interlock with lush Red Mangos, Coconut Water and Sugared Orange Blossoms. Sun drenched woods and Sensual Musk embrace this scent ensuring a long lasting fragrant appeal." Virginia Tech for Men ~ "The spirited energy of Virginia Tech’s maroon and orange signature colors are reflected in the men’s fragrance. An aromatic blends of citrus, dark woods and spice combines with the powerful aroma of cedarwood, sage, black peppercorn, vetiver and amber. Top notes reveal the freshness of bergamot and neroli." Virginia Tech for Women ~ "This fragrance reflects dramatic campus beauty with enchanting accents of Iced Juniper, Lavender, Geranium and fresh herbs. Bright citrus top notes of Valencia orange and Kaffir lime intertwine with a crisp airy breeze. A classics back drop, as rich as the traditions of school, provide longevity and strength with notes of White Amber, Patchouli and Cashmere Woods." North Carolina State for Men ~ "Beware of the wolf…Earthy and powerful notes of Cedar, Red Patchouli and Sandalwood are enticed with aromatic Lavandin and Blue Sage. Alluring top notes of Spicy Cardamom and Zesty Citrus are guaranteed to entice the senses." North Carolina State for Women ~ "As lively as the females of NC state themselves, this fruity floral fragrance captures their exotic charm and charisma. Sun-kissed fruits of Granadilla, Kiwi and Cherry Nectar entwine with Red Petals, Jasmine and Passionflower. Sun-bleached Woods and Sensual Musk envelop this fun fragrance creating a noteworthy, light hearted scent." This looks like one big yawn to me. Well, thank God someone at least had enough sense not to put anything orange in the Aggie scent! What are the odds the eventual Alabama bottle has houndstooth on it?? That is a question I am not qualified to answer. Guessing you are!